Basal bark works. Applying brush herbicide with a mineral oil carrier allows the herbicide to be sprayed on the bark. The mix absorbs into the basal cells of the bark where all the action occurs in a tree or shrub. Hence the term, basal bark herbicide application. 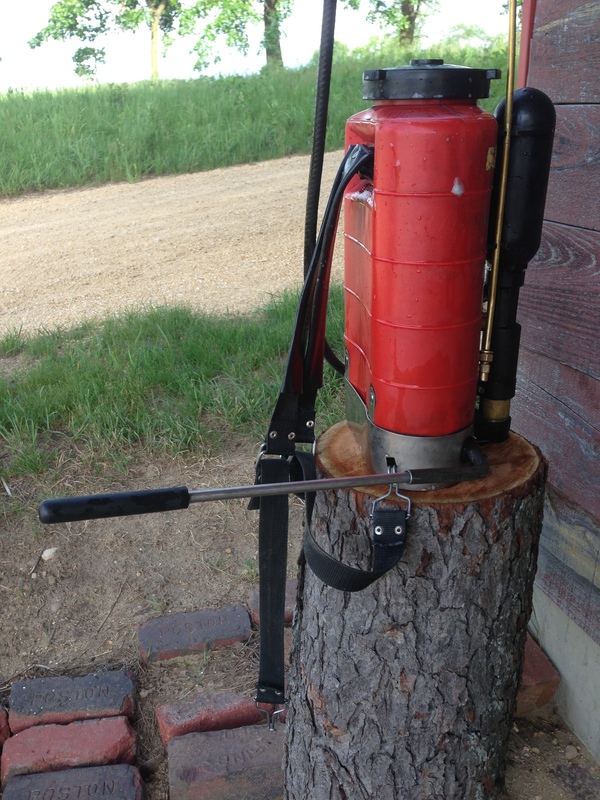 Below is the expensive Birchmeier backpack sprayer. Many people use these because their seals hold up better with the mineral oil carrier. Elsewhere on this blog I have written about these packs. There may be other packs that do as well. Let us know if you have a pack you have time tested. 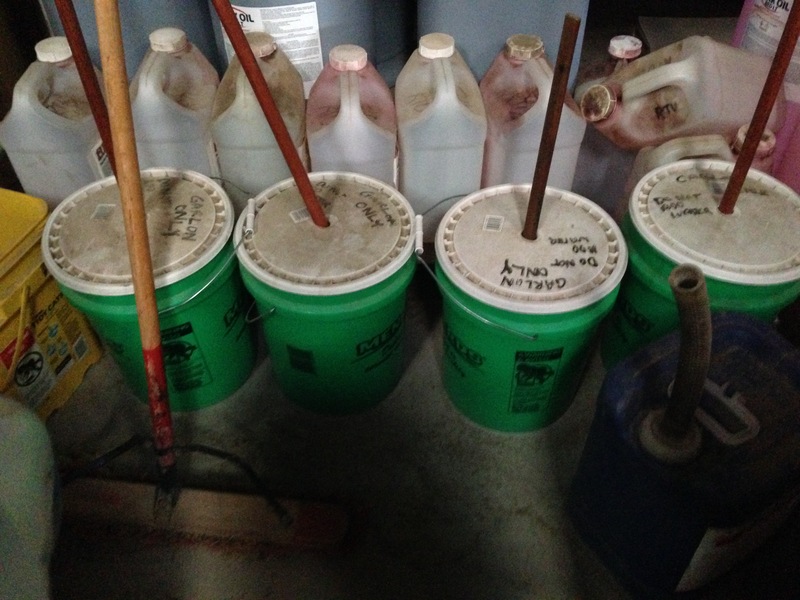 Below are some of our paint roller applicators sticking out of the buckets. 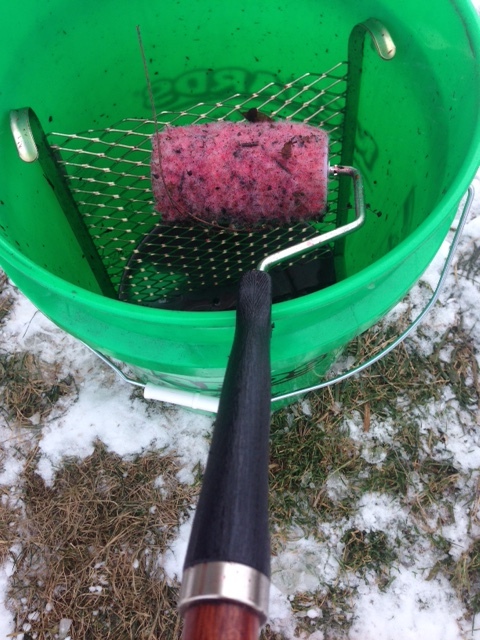 In the bucket is an inch of basal bark mineral oil herbicide mix. You have a 5 inch long paint roller on a handle cut to about 30 Inches. There is a screen to roll back and forth on to get rid of the excess solution. Make sure roller has stopped dripping! Then take roller to your honeysuckle and roll the solution on the stems. This works. It is several times faster than cutting and treating the shrub. It is quiet and safer than running a saw. It works as well as cut stem treatments. This entry was posted in Uncategorized and tagged basal bark, garlon, honeysuckle, invasive, shrub. Bookmark the permalink. I like seeing the process of branches coming down, and keeping track of where I’ve been / where I’m going. In hi-vis areas where I want attention (to show work being done) this is also a plus. Thought I freely admit I’ve never used basal bark and now I’m intrigued. Could I get started with a regular plastic backpack sprayer without doing too much damage to seals one time? A “regular” pack may work for a while, or a long time. I have heard various reports. Do get all the water out of the pack as water and mineral oil can produce a pudding in your pack. Give basal bark a try. Buy some blue tree marking paint to prove it to yourself. We have been basil barking for six years. It is by far the most efficient way to manage invasives. We have had great success basal barking buckthorn, honeysuckle, autumn olive, multiflora Rose, oriental bittersweet, Siberian elm, hybrid invasive pear, Russian mulberry and even some natives that can be aggressive- box elder and prickly ash for example. We are getting our farm back! 2) what is advantage to mineral oil vs. diesel? 1. No upper limit I have seen. I tend to be a band of herbicide around the tree equal to the diameter of the tree. 2. Diesel stinks when you get it in your clothes, but it costs less. The mineral oil carrier has some other chemicals in it that the makers likely would tell you make them much better. I don’t know. I stopped using diesel after hearing complaints about people getting it on their clothes. I too like to cut down and clean up my efforts. It makes me quite proud to be able to see through the trees in this particular 1&1/2 acres adjoining my property that I took on as a challenge. But this stuff (bush honeysuckle) is everywhere so I can’t envision ‘cleaning up’ after myself throughout the township. I am curious about the length of time it takes for the honeysuckle to break down after it has been killed. Thanks for comment, Brian. After a shrub is killed with herbicide it will break down over the next few years. Bigger shrubs stand around longer. I have used a brush mower to knock down honeysuckle after they have been killed, but usually our controlled fires get rid of them. You can also mow the live plants and spray the re-sprouts in late spring as they emerge. I like to spray re-sprouts with the same basal bark mix, getting the herbicide close to the ground on the shredded stummp and the little emerging stems. I am not aiming for the leaves. Last year I painted blue 40 shrubs I did this way and tracked them over the summer. All died.